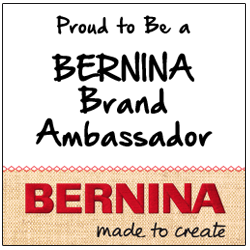 Thank you for signing up to receive my newsletter! I appreciate your interest in my work! The last leaves are falling from the trees here in New England. 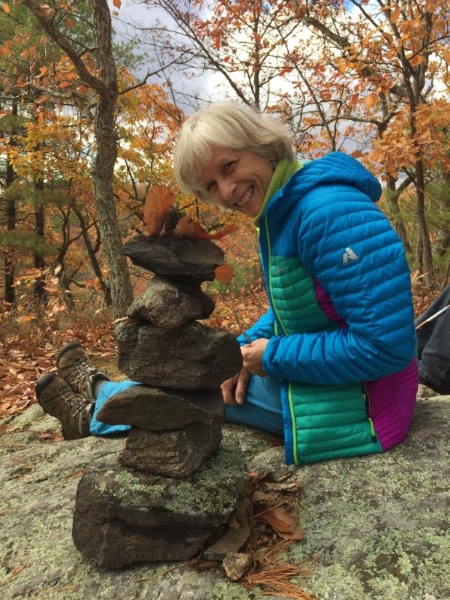 On a recent hike I had fun adding a few of the remaining leaves to decorate a cairn! 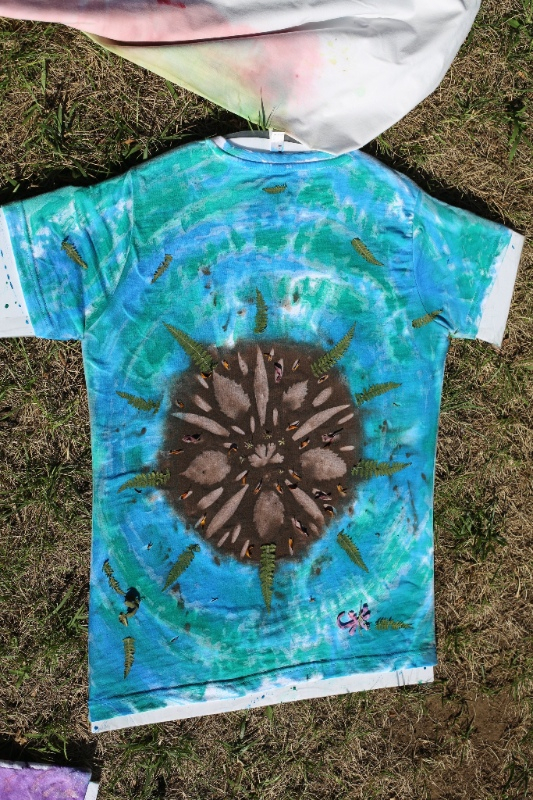 On an even more creative note, my daughter and granddaughter used leaves and flowers from my garden to create this cool sunprint mandala on a t-shirt. 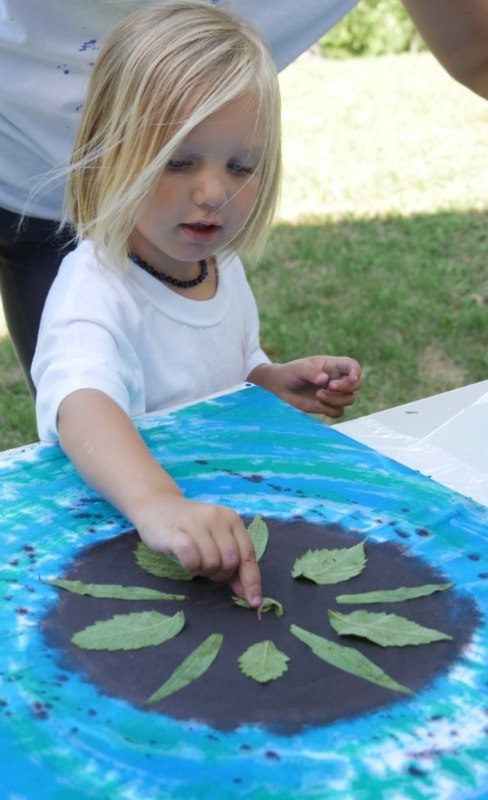 They used Pebeo Seta Color sun sensitive paints. As you can guess, these photos were taken at the end of Summer (after my Summer newsletter was sent). 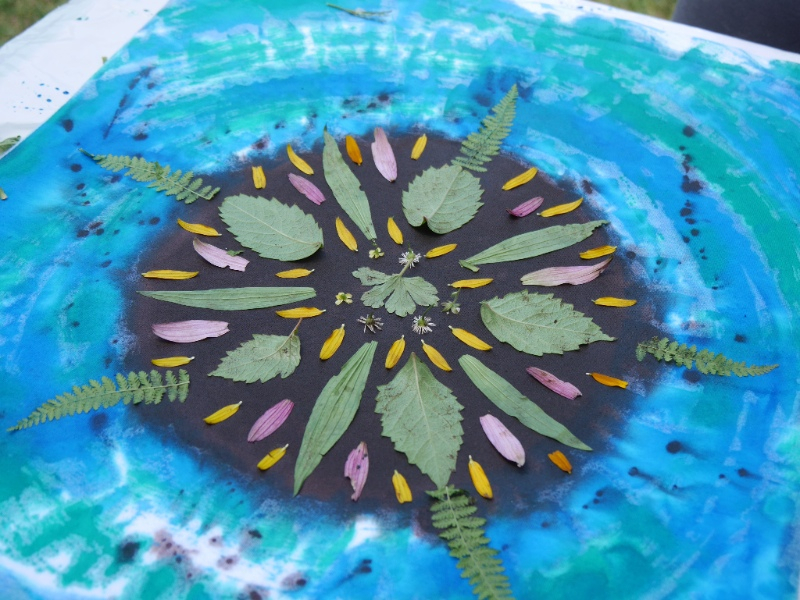 I look forward to next Spring when I can experiment more with this Garden Mandala idea. 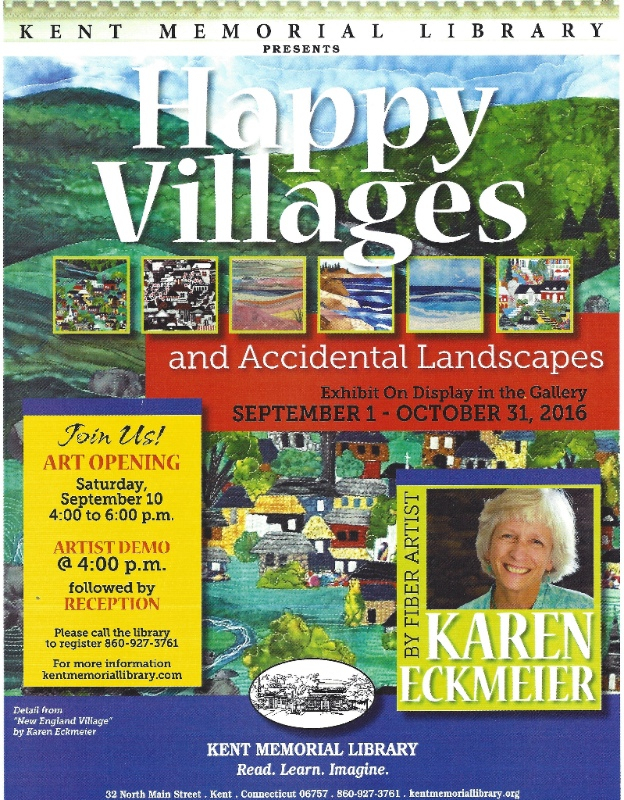 In September and October I had my Happy Villages and Accidental Landscape exhibit at the Kent Memorial Library in Kent, Connecticut. I had 64 small quilts on display. Several sold, with a percentage going to the library as a donation. At the opening reception I gave a demonstration on my collage and layered topstitching techniques, which you can view on my YouTube channel. NEW QUILT - "Technical Etude in C"
I made this quilt to celebrate my second year of flute lessons. In the beginner methodology book many of the lessons were called “studies." As I progressed to the intermediate book they all of a sudden became “etudes.” Fancier titles and exercises that were much more difficult! 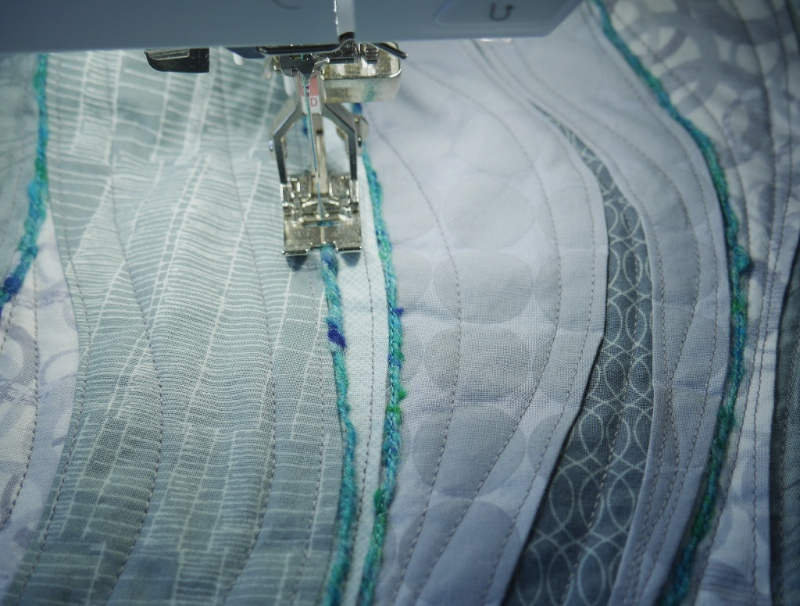 Although technical flute etudes are not easy, I do admit that I enjoy the challenge, so I thought that it might be a fun to challenge myself to try a technical etude in fabric as a parallel exercise. 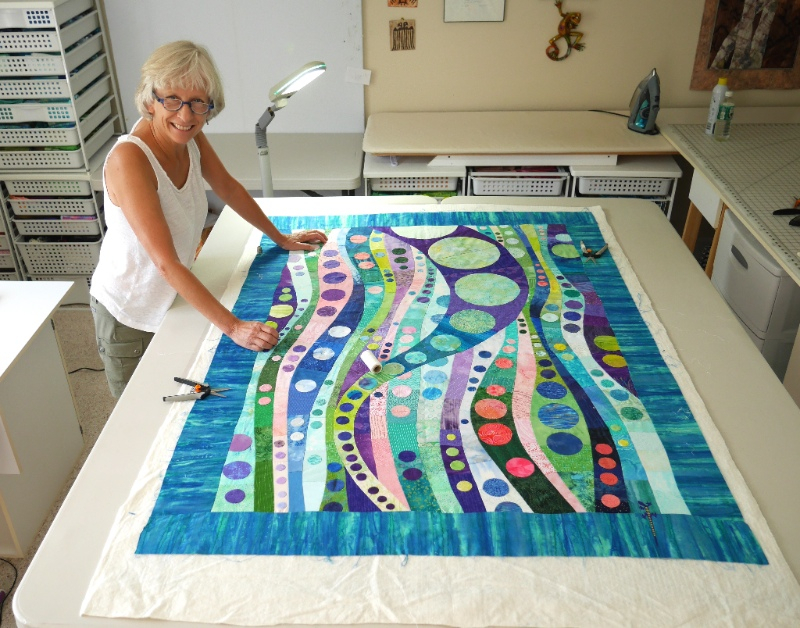 The “C” in the title refers to my "C major fabric chord” of Curves, Circles and Color. 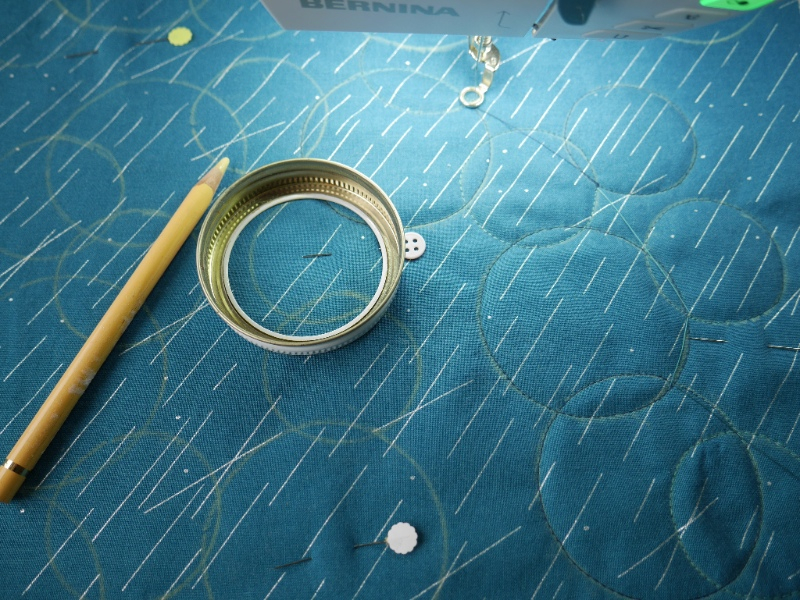 As many of you know, I love to create topstitched curves, which are easy and fast. The challenge for me was to go back to my roots of curved piecing with freezer paper templates. Any circle that was too small to piece was hand appliqued. 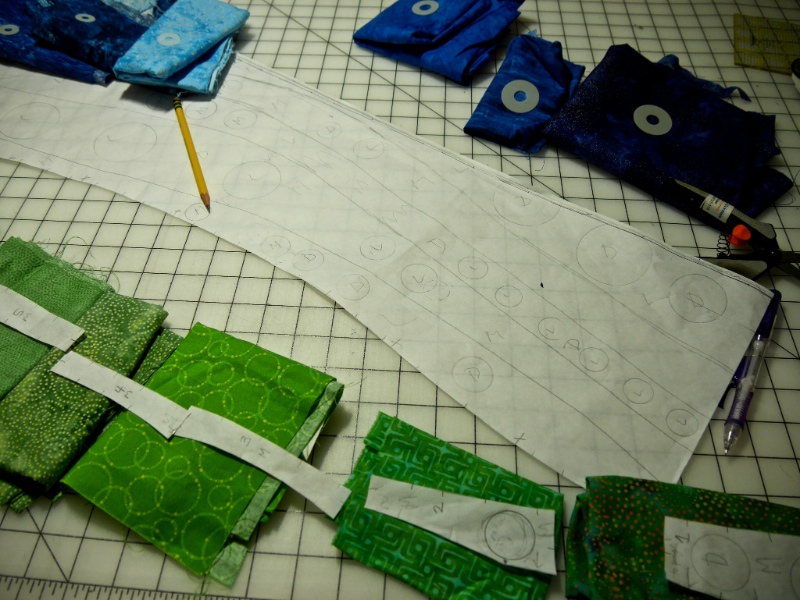 Here are the freezer paper templates ready to be cut and ironed to the back of the fabrics. The process is very technical, or should I say very tedious!! Here I am at the basting stage. Can you find my lucky lizard? 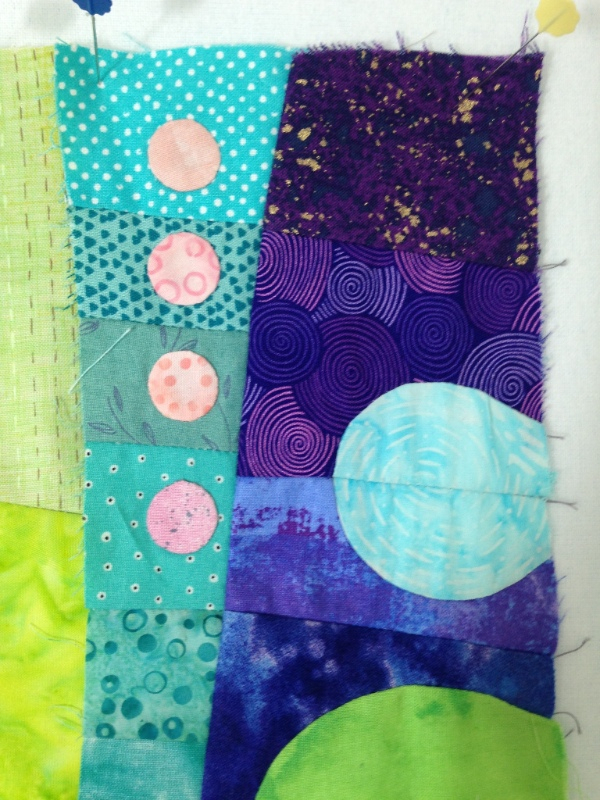 Here is a close up of quilting. 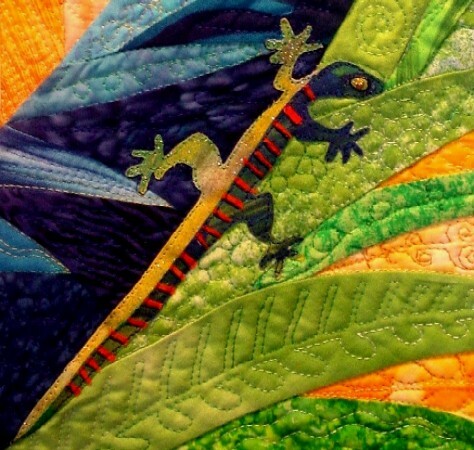 I wanted the feel of music to be carried through in the quilting lines. 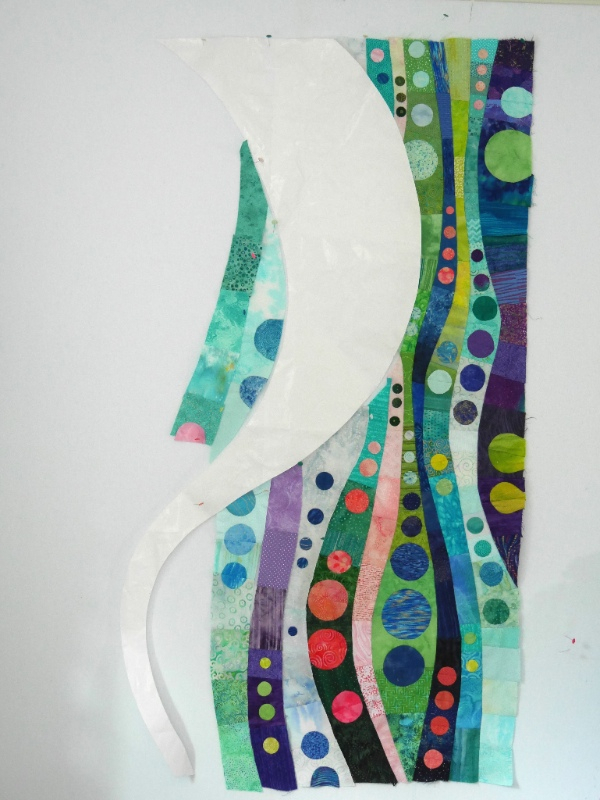 It was nice to slow down with this project, but even better to get back to my topstitched curves and fabric collage, which are more playful and less stressful! 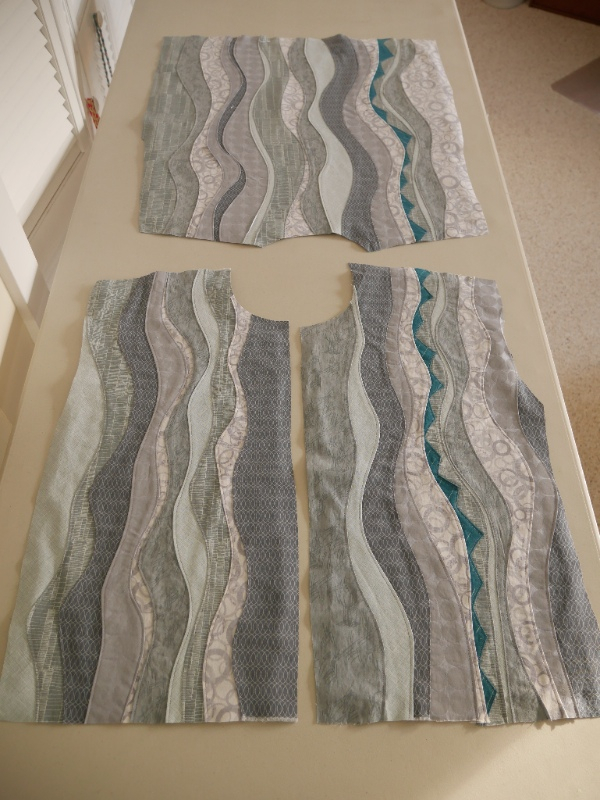 I was teaching in Lawrence, Kansas in October and bought some beautiful gray prints and a turquoise with dashes of silver to make a new Wearable Waves jacket. 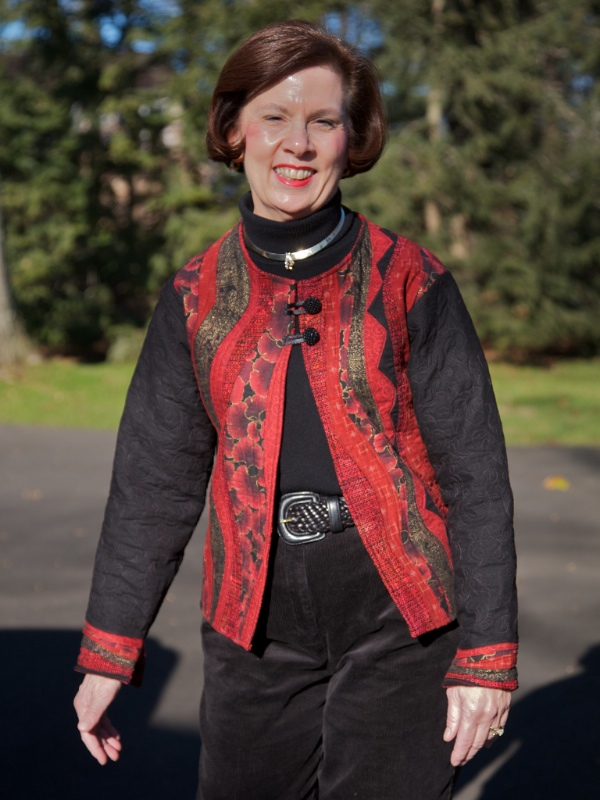 This is the “Energetic” style on pages 38 – 41 of my Wearable Waves book. 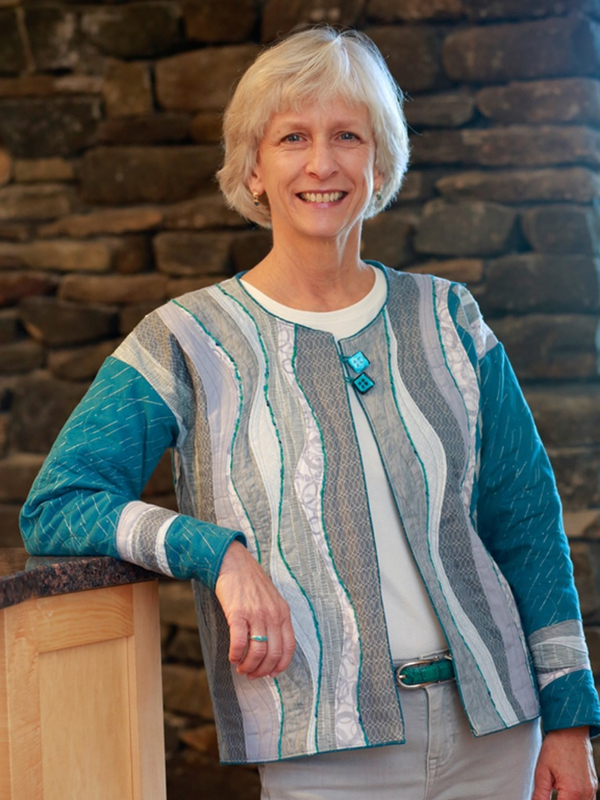 Here I am in the new gray/turquoise jacket next to Sandra in the red/black version in the book. 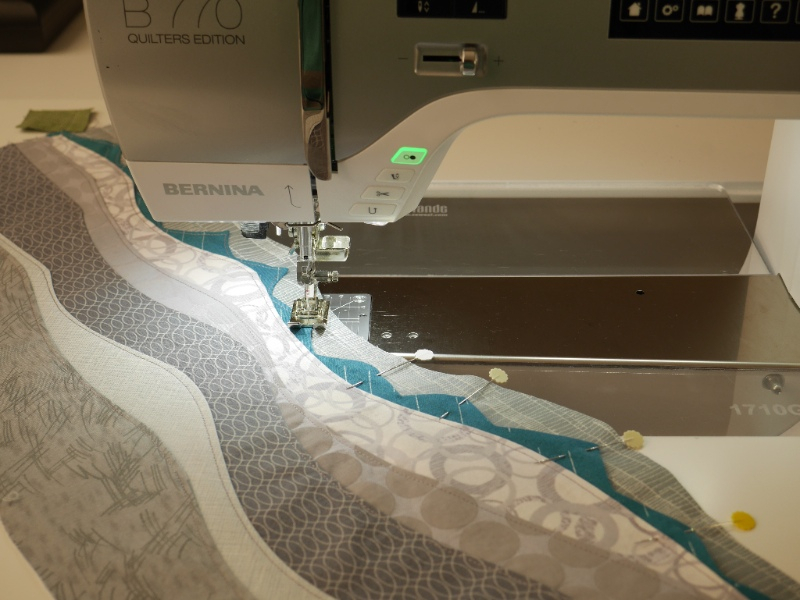 Here’s the process of creating the Layered Waves fabrics to fit the sweatshirt pattern pieces on my wonderful BERNINA 770QE. I used two different size circles (outside and inside of rim) from the my preserve jar lids. 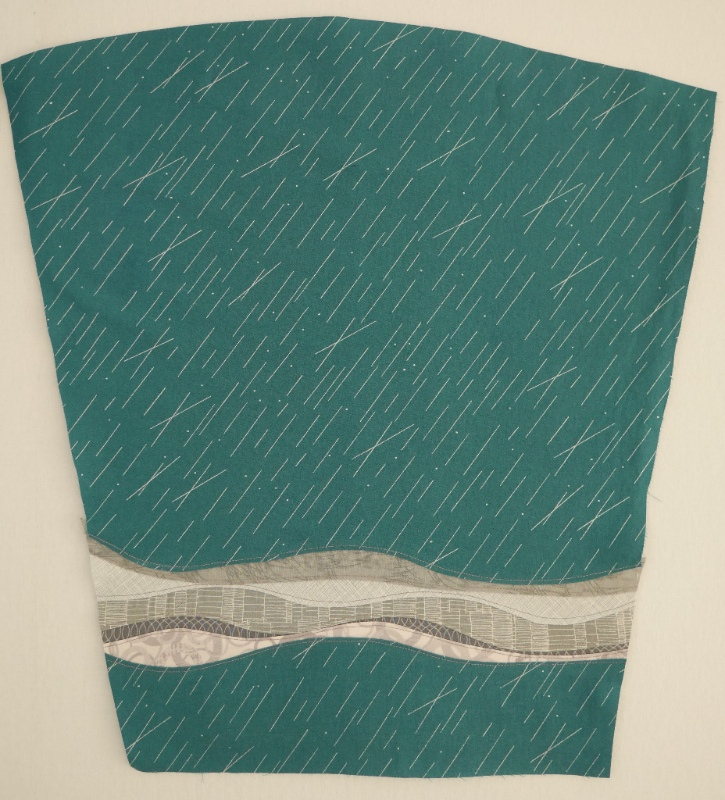 Since the silver lines in the turquoise fabric (on the sleeves) looks like rain, I quilted intersecting circles to look like puddles….hence “puddles in the rain” quilting. 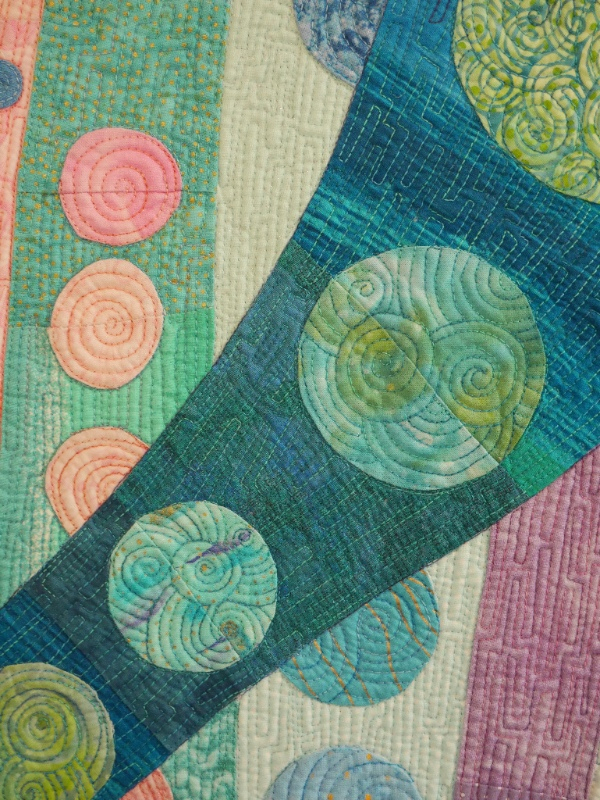 For a little extra color I couched turquoise yarn along the edges of the topstitched curves. My version of couching yarn to fabric, is to glue baste the yarn in place then use a simple straight stitch to secure it to the fabric. Normally a zig zag stitch is used, but that sometimes flattens the yarn too much, so I opt for the single line of stitching in a matching thread. I’m finished teaching workshops for 2016 and will take a little break until January when I start 2017 with a trip to teach in Albuquerque, New Mexico. New workshops and updates are listed here in the 2017 calendar with an asterisk. For those who really like to plan ahead, I have included my 2018 calendar. 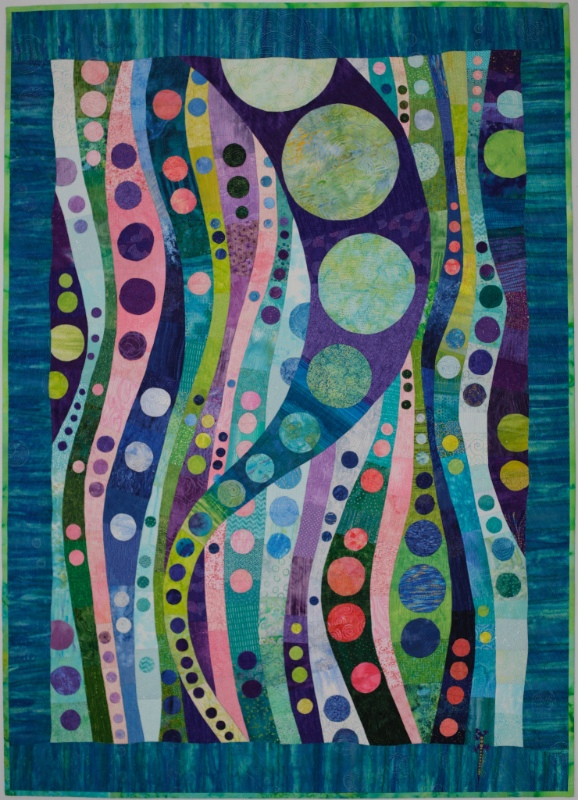 *Faithful Circle Quilters, Columbia, MD Oct 7-9: 10/7 Scrappy Layered Log Cabin workshop, 10/8 Happy Villages, 10/9 Eve. Still Makin’ Waves lecture.